Free Freight on Retail Orders over $250 in the USA (Excl. AK & HI). Online Orders Only. CORONA, CA - April 11, 2019 - Pro Circuit has recently released new clutch covers for the 2019 YZ250F and the 2019 KX450 models. Pro Circuit clutch covers are CNC-machined from T-6 billet aircraft-grade aluminum to improve durability and heat dissipation. Cooler operating temperatures means improved performance. Here's your chance to add a product to your YZF or KX machine that is stronger, lighter and will also add a works look that the OEM cover never could. 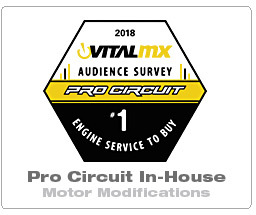 CORONA, CA - April 9, 2019 - 2018-2019 YZ450F riders can always expect first-rate performance parts from Pro Circuit and the new intake camshaft for your Yamaha doesn't disappoint. The new intake camshaft from Pro Circuit provides superior performance upgrades over stock (HP/torque) by optimizing the lobe profile for increased lift and duration. The new YZ450F by Pro Circuit is a must-have upgrade for any serious racer wanting to separate themselves from the rest of the pack. Adding new components to your motorcycle (especially to the engine, suspension or braking system) may radically alter the acceleration, deceleration, handling and braking characteristics of your motorcycle. 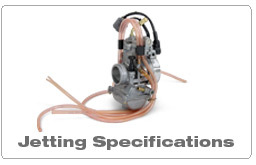 Ensure that all parts are installed and properly torqued per the instructions supplied with the part or to the motorcycle manufacturer's original specifications. Test the motorcycle with the new part(s) on level ground, at low speed, without any other vehicles or obstacles nearby, to ensure that it is working properly. Periodically recheck, adjust or replace the parts as may be necessary depending upon the terrain, use, mileage and rider input. 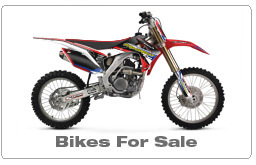 Consult the instructions supplied with the part, or the motorcycle manufacturer's original specifications for further details. The failure to properly install, maintain, or familiarize yourself with the new part's use, and proper operation, may result in damage to the motorcycle, and/or a loss of control, resulting in serious injury or death. Buyers assume all risk for any and all damage caused to themselves, a third party and/or property by virtue of failure of these products. 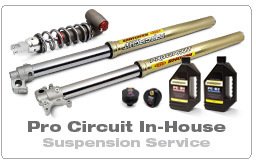 By installing and/or using a Pro Circuit Products, Inc. product, you hereby accept and understand these stated terms and conditions.